This mural is located at 31 State Street Sodus NY on the side of Laundry Junction which is on the south side of the street. 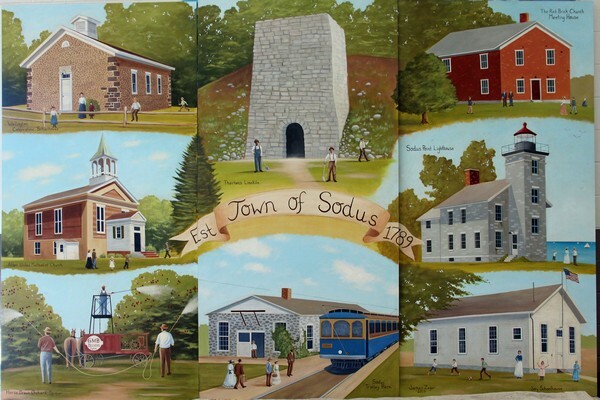 The Town of Sodus Mural consists of 8 images representing the five hamlets and two villages contained within the Township. The area contains the hamlets: Sodus Center, Alton, South Sodus, Wallington and Joy. The Villages are Sodus and Sodus Point. It also contains an orchard farming scene that pays tribute to our rural agricultural heritage. The Wallington Cobblestone School committee wishes to thank the Sodus Chamber of Commerce for including the school on their mural. 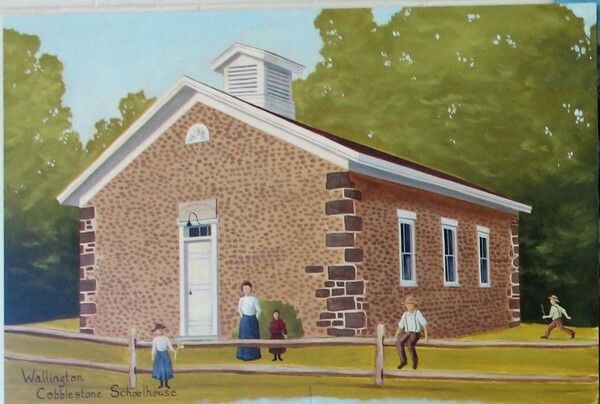 In 1826, work started on a cobblestone schoolhouse in Wallington which would replace a log structure which was built in 1809. It was built by William Swales, Sr. who constructed 12 other cobblestone buildings in the Sodus area including the Maxwell Creek Inn Bed and Breakfast cobblestone house. One of 23 schoolhouses which eventually served the Sodus area, the Wallington schoolhouse was used for 125 years until the schools were centralized into larger buildings which could house greater numbers of students. It is the only one which is still used for its original purpose. Not a great deal is known about the earliest days of Wallington but early records give us a flavor of our pioneer past. For example, records show that there were bounties offered for the killing of wolves and panthers. Hogs were allowed to run wild from the first of November to the first of May. As with all such country schools the teacher was responsible for teaching all of the grades. We can imagine that there would be a few children in each of the eight grades. It is surprising to find out that the enrollment of the school reached over 100, according to the Commissioner of Schools book, 1848-1867. In 1853, sources show Wallington schoolmaster’s salary was $2.28 a week. By 1897, the cobblestone stone school was in need of repairs and the local citizens banded together to do the necessary repairs. 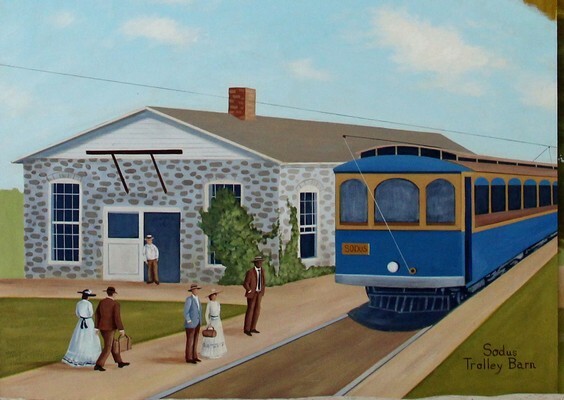 By then the railroad line through Wallington to Sodus Point had been operating for over 20 years and the trolley line which would run parallel to the railroad was under construction. Skipping ahead to the 20th century, we find the school house still being operated; by now lit by electric lights and heated with a kerosene furnace instead of a pot belly stove. After the centralization of the country schools, some country schools fell into disrepair and some were turned into homes. Our little schoolhouse was taken over by the Wallington Community Association who acquired the ownership from the school district. Meetings were held and efforts were made to use the building for community events. In 1974, several community members became upset at the gradual decline in the condition of the school. At this time, our nation’s bicentennial was approaching and this inspired many projects locally and though out the United States. A meeting was held at the Harold and Janet Wunder residence. At the time, the Wunder’s son, Dale, was doing research of the school’s history for a Hoffman paper about Wallington. At that meeting ideas were discussed about renovating the aging structure. Using mostly local people, the repairs began. The whole back wall was torn off and stones were gathered from nearby farms. A local mason was hired to lay the foundation and finish off the back wall in as authentic a fashion as possible. Many other repairs were also achieved such as putting in electric heat. A book was completed about Wallington’s history by community members and sold to help offset repairs. 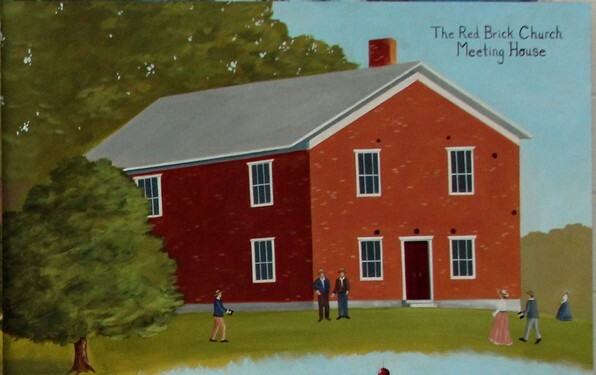 Once the building was habitable again, Pauline Israel, a retired sixth grade teacher, proposed opening the school for field trips for grade school students. Sodus Central School brought the first classes in the early 80’s and the program blossomed to include over 1000 fourth graders a year. Schools from as far away as Oswego and Rochester have taken part in the program, “A Day in the Country School”. . Currently there are two excellent volunteer teachers who handle the spring and fall term. Most children dress in period costumes and all are given a different name and assigned a different grade. Efforts are made to make the day as authentic as possible including possible punishments such as the dunce chair. Games such as “Annie, over the Shanty” and others are played during recess. In 1994, the Wallington School was given National Historic Landmark status thanks to the persistent efforts of Flora Murphy. For tours or donations to the school, call Janet Wunder 483-9791 or Martha Miller 483-8454. The school is located at 6135 North Geneva Road. 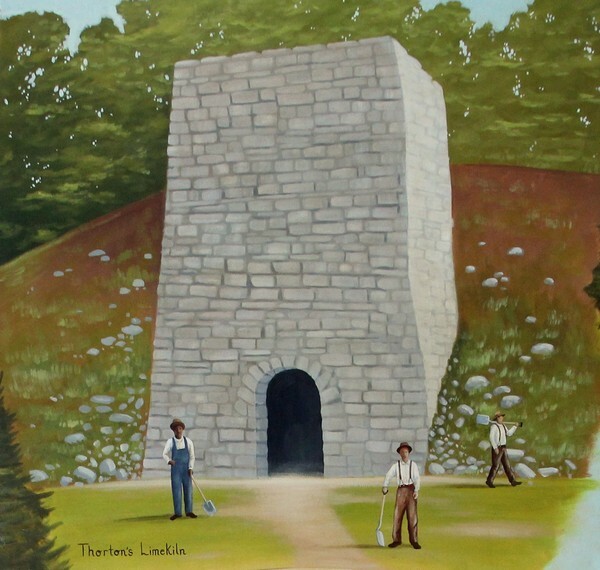 The Thornton’s lime kiln was on the corner of South Geneva Road and Lime Kiln Road in South Sodus. Built in the mid-1800’s, it was removed when the intersection was redesigned about 2010. The most common by product of burning lime was quicklime, which was used to make plaster and mortar for building construction. It was also used in the pickling process for food, and by spreading it on soil to reduce the acidity and increase alkalinity. It also permits improved water penetration for acidic soils. Quicklime was a necessity in the maintenance of the “privy”, and the local undertaker made use of it in burials. In order to produce the quicklime, the stone was brought from the nearby quarries or outcropping. Logs were harvested year ‘round for the fire needed to heat the kiln to very high temperatures. The limestone was crushed into 1 inch to 2 1/2 inch chunks and was poured into the opening from above in successive layers of stone and wood. When loading was complete, the kiln was ignited at the bottom, and the fire gradually spread upwards through the charge. When burnt through, the lime was cooled and raked out through the base. Typically the kiln took a day to load, three days to fire, two days to cool, and a day to unload, resulting in a one-week turnaround. The land was deeded to trustees of the “First Baptist Society of Sodus” by Lord Alloway and Masteron Ure for a chapel and burying ground. Work was started in 1824 and the opening ceremony was in July of 1826. The brick used in the building was fired from the red clay deposits found a mile north of the church on Geneva Rd. Without a police force the church had the duty and responsibility to act as judge and jury until legal authorities assumed this role. Some members of the church were “excluded” for working on the Sabbath, gossiping and the recorded adultery case banished both the woman and the man from the congregation. 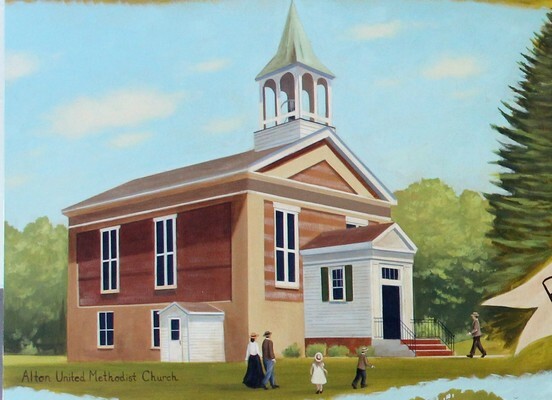 In 1834 fifty members were allowed to leave and form a new church in the west part of the Town of Sodus, and the first clerk was named James Hopkins. This was the same year that William Walling open his tavern in present day Wallington and it is felt that the the “saloon” may have triggered the split but can’t be proven. William Walling was the largest mortgage holder for the church and in 1843 the Church decided to tax its members and pay him off. William Walling and the Red Brick Church were forever separated when the church property was incorporated in the hamlet of Sodus Center, not Wallington. The single American fatality of the Battle of Sodus Point in 1813, Asher Warner, is laid to rest in this cemetery along with over 20 soldiers of the Revolutionary War and the war of 1812. And there are over 140 honored veterans of domestic and foreign conflicts also laid to rest here. But even earlier than this, Native Americans had used this place even prior to the earliest dated tombstone of 1809. After years of declining members, the church was disbanded in 1926, 100 years after its start. Fearing that the property might be sold to “unsympathic parties or fall prey to arrogant agents of progress”, local history enthusiast Edward C. Delano bought the property. The Church and surrounding grounds became the ward of the Sodus Center Baptist Rural Cemetery Association on July 25, 1927. The structure is in exceptional preservation and continues to hold services and ceremonies for weddings and other events. With no electric, the simple and sincere atmosphere is preserved. On August 8, 1996 it was placed on the New York State and National Register of Historic Places. Located on Old Ridge Rd near Rt 14 in Alton. It is nice to see the cobblestone church building in this mural. The beauty of the stonework attracts many sightseers to stop, walk around the structure and take pictures of a classic. The skill and art used in this type of structure was that of German immigrants who needed work to support themselves and their families. A contract was sent out and men began work on this church in about 1850. Stones were found along the shore of Lake Ontario and transported some five miles by horse or ox power. In the early life of these small rural churches such as this one, they served not only as religious centers but as a center for a multitude of other functions as well. Pot luck dinners, Sunday afternoon entertainment of a proper nature, playing games, baseball, checkers and chess, just to name a few. The community surrounding this church was all invited. Churches were social and cultural centers as well as centers for spiritual and christian development. This was effected by modes of transportation over the years, especially in small outlying communities in a township such as Sodus. With the advent of better and faster transportation the small settlements began to shrink as people migrated to larger population centers. As a result, many of the small businesses failed as well as the small rural churches. People are having to travel greater distances for the services wanted and needed. Many small churches such as this one will gradually disappear from the landscape. It is hard to say what will happen to this beautiful cobblestone structure after the spiritual and christian activity no longer exist in the Alton United Methodist Church. Thank you for preserving this historic structure within this mural. History of the Historic Sodus Bay Lighthouse . In 1824 congress approved the construction of a lighthouse at the western entrance to Sodus Bay. The land was purchased from Captain William Wickham on November 20, 1824 for $68.75. A 40 foot stone tower was constructed at the edge of the bluff, which housed a revolving light of ten lamps and reflectors. The keepers dwelling was a separate house built of the same stone, the house was two rooms and measured 34 by 20 feet. The total cost of these structures along with the 3 acres of land on which they were built was $4,568.75. By 1868 the original tower and keepers dwelling were found to be not “worth general repair.” Congress approved the Lighthouse Board’s request for $14,000 to construct a new dwelling with attached tower in July 1870. Work began in August of 1870 on a two-and-a-half story dwelling with the tower attached. The new lighthouse was completed on June, 30th, 1871. The lighthouse was constructed from limestone from quarries in Kingston, Ontario. The same general plan had been used for the lighthouse at Stony Point, New York. The new light was 45 feet above ground level. The old tower was demolished and the stones were used to create a jetty to prevent erosion on the bluff. The original entrance to the lighthouse was the door at the base of the tower. The large bathroom on the first floor was originally an oil room. The Sill Room was the kitchen and pantry, and the Arney room was the parlor. The Ward Room was a small bedroom. On the 2nd floor there were 4 bedrooms. The spiral staircase was the only original staircase. At the “front” of the lighthouse there was a covered lean-to with a cellar and woodshed. An outhouse was located in the northwest corner of the building. In 1892 a new addition was added to the lighthouse in the location of the lean-to, now the Chamberlain room, which became the kitchen. The dining room was located in the gift shop and the gift shop office was the pantry. On the 2nd floor two small bedrooms were added in the extension. The Sill Room became another living area. An oil house was built 128 feet south of the house and lined with brick to store the kerosene. Due to the construction of the breakwater at the western entrance of the bay in the early 1830s and subsequent filling in of the land and construction of the Outer Light, the Lighthouse had become redundant. In 1901 the light was decommissioned after only 30 years as an active Lighthouse. The fourth order Fresnel lens was removed and transferred to the outer pier tower. The keepers maintaining the pier light continued to use the house as a residence. Around this time the large restroom, which had been an oil room, was converted into an office. The next changes made in the lighthouse happened when the U.S. Coast Guard took over the administration of lighthouse in 1939. A bathroom was installed where one of the small bedrooms on the 2nd floor had been. A staircase was added in the interior leading to the 2nd floor. The garage was constructed, which included laundry facilities in the back. In 1953 Edwin Ward, the final keeper to live in the Sodus Point Lighthouse, retired from the U.S. Coast Guard and left the dwelling. 24 year old Station Chief, Harold Ayres, whose role had expanded to include search and rescue, boating safety, law enforcement and harbor master duties, moved in with his family the same year and resided there until 1958. For the next decade the Coast Guard used the building as office space and quarters for 8 guardsmen. In June of 1984, after an 18-month effort led by Congressman Frank Horton, the lighthouse deed was formally presented to Sodus Town Supervisor George Arney. 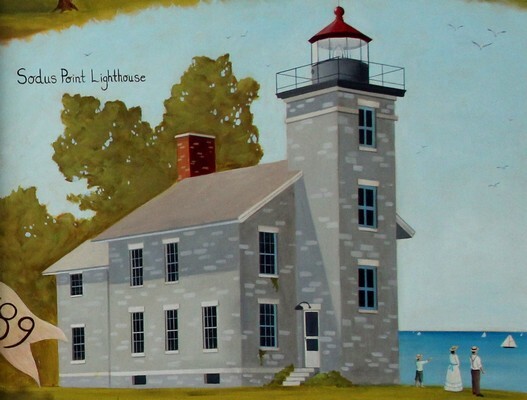 Ownership of the lighthouse along with a half-acre of land was transferred from the General Services Administration to the Town of Sodus, and was leased to the Sodus Bay Historical Society. In 1985 an apartment was created on the 2nd floor and the southwest bedroom was converted into an office. The Sodus Bay Historical Society established a maritime museum, research library, and gift shop in the lighthouse which now shares our areas history with visitors from around the world each summer season. How farming has changed, starting in January and progressing through the year as seasons change, and the jobs that come with it. self-propelled trimming baskets that no longer require the use of ladders. Old Style : 40 feet X 40 feet plantings of apple trees, approximately 27 per acre. trees to fill their space and produce is no longer viable today. individual trees with no protection for either driver or spray man. gallons per acre. Much safer for operator and environment. delivery to the processing plant. New Style: #1 Market for tart cherries today is dried cherries. ground. There would be 3 or more bushels per sack. platform has apple bins on the machine so the men never have to get off. The Trolley Barn was built in 1904 as a trolley barn and repair terminal. It is located at the east end of town and was referred to as the “barns”. It was used to store and repair trolleys in the village until June 28, 1929. 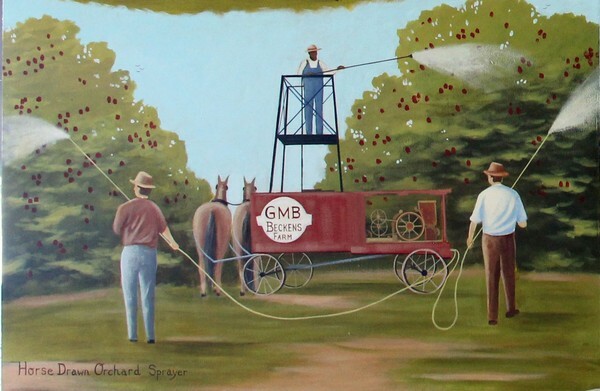 Just outside the barns was a wonderful invention called a “balloon switch”. You could turn a trolley around all the way and head it back to Rochester. The trolley line was called the Blue Line or the Apple Blossom Route. It ran from Rochester to Sodus Point. After the end of the trolley system the building was subsequently used by the Rochester Transit System to store their buses and by the Sodus School District to house school buses prior to construction of the bus garage. The building was also used by GLF Petroleum Company for storage of Fuel trucks and in the early 1950’s Robert Johnson, then the local Chevrolet dealer, operated a used car conditioning shop and a used car Lot on the premises. In 1960 it became a laundromat owned by John Buzzell of Newark. John added the second and larger portion of the Building three to four years later. On April 28, 1977 the building caught on fire. A faulty aluminum electric cable is believed to be responsible for the fire. The fire destroyed the building . At the time of the fire the owner was John Buzzell Jr. also of Newark. The station stood empty for 15 years until the Hombergers and Hermanet‘s bought it and opened Another Laundromat and the Ice Cream Junction in January of 1992. Today it still houses Laundry Junction and Everyday Gourmet Bakery/Ever Young Natural Foods. My brothers and my sister and I attended the Joy school. My teacher (and probably the others) was Miss LeRoy. As we lived on the corner of Joy and Hill Roads, it was quite a walk for a little girl. (I can remember my Dad walking me to school on his shoulders thru the snow.) My oldest brother was in 8th grade there when I started-he and my other brother, Henry, and my sister, Betty, were ahead of me. I have been told the teacher said, “Oh no! Not another DeVey!” My family moved to Sodus when I was in the fourth grade. I don’t ever remember closing school because of weather! Maybe because the teacher boarded at the home across the road! 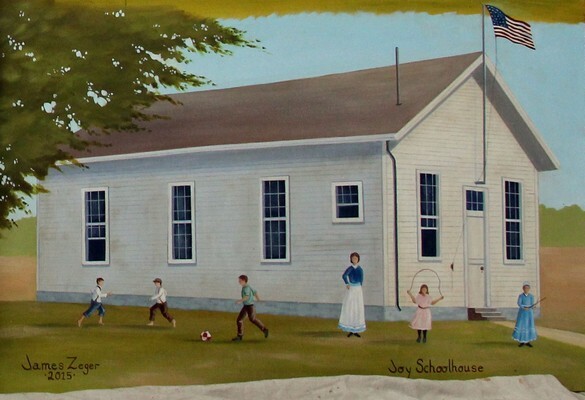 What a difference it was in 1942 when I transferred in second grade from the main school in the Village of Sodus to the Joy School…one teacher and six grades. Mrs. Hill was our first teacher, and then Miss Grimm for my remaining years there. I remember the importance placed on our spelling tests and Math…those were the two subjects I recall…there was no Science or Social Studies. In the later years, the Town District sent a gym and music teacher twice a month, if we were lucky. Our heat in the winter was a furnace in the basement, with one large register in the center of the building. We usually walked to school, approximately one mile, in most weather conditions. We were fortunate to have a pond just down the road from school, which froze over in the winter and was a great place for us to skate. We would bring our skates to school, going early before school started. I remember being late one morning…that was the end of that! We did skate after school. In the spring, we played baseball and kickball. There were three large trees, perfectly placed to serve as our bases. At Christmas and the end of the school year, we produced programs, plays, read poems, and sang songs. We even had a stage in the school for this, and our parents were invited. After sixth grade, students were transferred to the high school. That was a big change! This is most of what I remember of the Joy School. You will notice that African Americans are pictured in a number of the images in the mural. African Americans have played an important part in our town’s history from its founding. Pioneer settlers began to arrive in the area that eventually became Wayne County around 1789, with most hailing from eastern New York and the New England states. African Americans were among the pioneer settlers of Wayne County, New York, and have been part of the fabric of the county, including Sodus, throughout its history. Most of African Americans who arrived in Wayne County between 1789 and 1810 did not come as free persons of color, but as slaves of southerners who had been enticed to the area by the salesmanship of Charles Williamson. The three largest slaveholders of Wayne County – Capt. William Helm of Prince William County, Virginia; Daniel Dorsey of Frederick County, Maryland, and Col. Peregrine Fitzhugh of Maryland – brought between 120 and 180 enslaved persons with them. Those African Americans joined the ranks of the pioneers of Wayne County. The African American community that grew up along North Geneva Road in Sodus got its start about 1812 and descendents continued to live in the area until the mid 20th century. Two of the first landowners in the community were David Cooper and Abraham Braddington, both former slaves of Peregrine Fitzhugh. The offspring of both men worked the land, married and settled into jobs where work was available. These formerly enslaved men along with their wives Polly Cooper and Veny Bradington joined William & Sarah (Plumber) Newport and Thomas & Rosetta Lloyd as the earliest settlers who formed the fabric of community life in Sodus. While few maiden names remain for the newly freed women of color, their contributions to their families and, by extension, to Sodus is incalculable. For the first half of the 19th century, discriminatory traditions, laws of disenfranchisement and outright racism conspired to limit social and economic opportunities for men and women of color. Still, the number of African-Americans continued to grow, and by the time Wayne County was officially established in 1823, there were 102 free persons of color living in households headed by African Americans and another 34 in households headed by white people. At first, free people of color worked almost exclusively as domestics and farm and day laborers. Over time, through land ownership and entrepreneurial endeavors a small middle class began to build made up of farmers, who owned or leased land, as well as barbers and small business owners. As noted by Judith Wellman and Marjorie Allen Perez in Uncovering the Underground Railroad “…black barbers played a significant role in the African American life during this time period, being active participants in efforts to expand the economic, social and political status for African-Americans…”. According to Perez, at least three of Thomas and Rosetta Lloyd’s sons became barbers in various villages along the Erie Canal. In addition, African-Americans served as religious leaders as early as the 1830s. Ministers such as George Shumway, James Gregg, and Abram Pryne often served several different congregations, living in parsonages or rented houses rather than in identifiable homes of their own. Significantly, Rev. Samuel Ringgold Ward, an African-American minister from Butler, NY, started a Free Congregational Church in Sodus that was primarily made up of former members of the Sodus First Presbyterian Church who considered slavery a sin. The break-away church lasted for 8 or 9 years as a platform for the Sodus anti-slavery movement before they united again with the Presbyterian Church. The African-American community continued to play an important civic role by harboring freedom seekers traveling on the Underground Railroad. When war to end slavery finally broke out, several African-American men from Sodus served in the Civil War – Charles Henry Cooper (grandson of David) was a sergeant in the 8th USCT. Charles H. Cooper, Thomas Lloyd and William Dorsey all left Sodus Point in the fall of 1863 to join the 8th United States Colored Troops (USCT), which trained at Camp William Penn near Philadelphia. William Newport of Sodus Point went to Connecticut to enlist in the fall of 1863. Thirty-nine-year-old James A. Potter of Sodus joined the 1st USCT, leaving his wife and six children at home. John Davis of Sodus enlisted in September of 1864 as a substitute for a drafted white man. Historic Sodus Point at http://historicsoduspoint.com/. Choose slavery on the menu bar. Uncovering the Underground Railroad, Abolitionism, and African American Life in Wayne County, New York 1820-1880 by Judith Hellman and Marjory Allen Perez with Charles Lenhard and others (Wayne County Historian’s Office, Peter Evans, Historian, with funding from Preserve NY and New York State Council for the Arts).